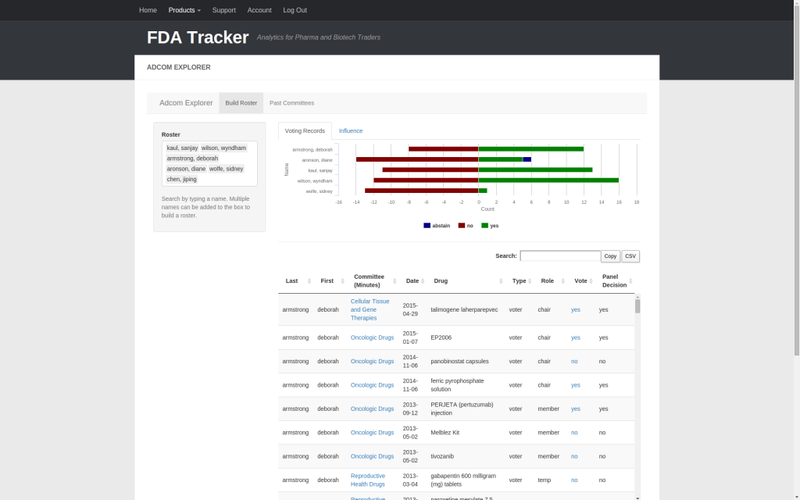 Adcom Explorer contains information on all FDA advisory committee meetings after January 1, 2008 that specifically mentioned NDA, BLA, PMA or HDE applications in their agenda and had a dichotomous yes/no vote that led to the recommendation of approval or disapproval of a drug. Meetings that covered multiple topics over the same day were considered to be multiple meetings. Multiple indications covered by multiple application numbers in a single meeting were also considered to be multiple meetings. Committee Selection – Select a past committee meeting to find summary information on voting results, links to FDA documents, and the immediate FDA decision. Adcom Explorer consists of two parts. 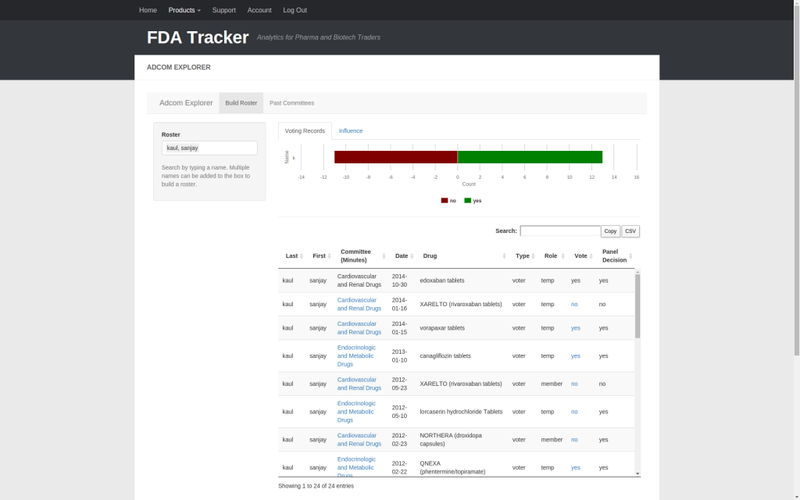 Build Roster displays FDA advisory committee voting records at an individual level, while Past Committees displays voting records at the committee level. Adcom Explorer initially displays a blank Build Roster tool. Suppose the FDA has just released its briefing documents for an advisory committee meeting and you’re interested in the voting history of the adcom members. Search by last name to reconstruct the draft roster. For example, searching for “Kaul” returns “Kaul, Sanjay”. Selecting Kaul immediately updates the “Past Vote Distribution” figure, which summarizes how many times each voter has voted yes (in favor of approval), no (against approval), or abstained. The table below contains detailed voting records for each individual, with links to the minutes and transcript to provide context for each vote. Adding a few more committee members to the list automatically updates the graph to include their information. 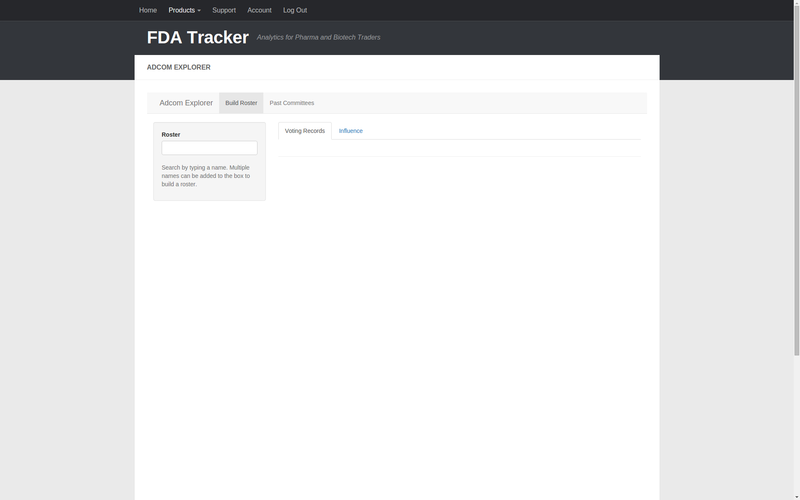 Adcom Explorer also contains information on FDA attendees. Adding FDA employee Jiping Chen to the roster does not update the voting figure because he does not have a vote as an FDA presenter, but the table will show that the panels voted in favor of approval once and against approval twice when he presented. The influence tab displays a graph of each person’s “influence” as measured by mutual information. Mutual information quantifies how much knowing an individual’s vote tells you about the overall committee outcome (i.e. how often an individual’s vote coincides with the overall decision). Here, we see that Wyndham Wilson’s vote is highly informative of the final outcome. In contrast, knowing Sanjay Kaul’s vote would tell us nothing about the committee’s decision. This can be used to weight your each person’s projected vote when making predictions. Clicking on the past results tab switches to the committee selection tool. 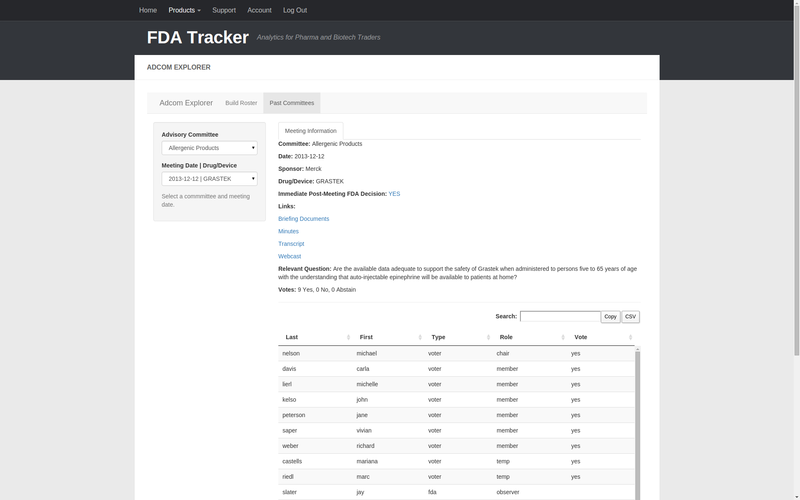 Choosing a committee and meeting date from the two drop down menus presents a summary of that meeting, including the committee name, date, sponsor, drug/device, immediate post-meeting FDA decision, links to important FDA documents, and an individual list of votes. In summary, Adcom Explorer is the premier tool for providing insight into the personalities that drive important regulatory decisions.